Xiaofang Fu from China won the 2010 Women's World 9-Ball Championship. In the final she defeated four-time champion Allison Fisher (England 9-7). Fu beat 17-year-old defending champion Liu Shusha in the semifinals and Fisher ousted Shu-Han Chang from Taiwan at the same stage. This was the seventh world title in a row for Asian players. The last non-Asian to win was Allison Fisher in 2001. The tournament ran from 23-29 August, 2010, in Shenyang, China. 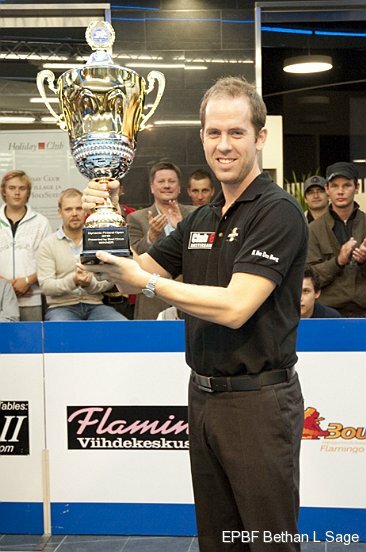 Nick van den Berg (Netherlands) won the inaugural 2010 Finland Open. van den Berg hammered current 8-ball world champion Karl Boyes (England) 8-1. The victory was worth 5000 € for the Dutchman and Boyes got 3300 € for second place. The final was a repeat of last month's Austria Open final. That time Boyes came out on top. In the semifinals of this 10-ball event van den Berg edged Mark Gray (England) 8-7 while Boyes defeated Mario He (Austria) 9-3. This was van den Berg's fifth win on the Euro Tour. The victory takes him to fifth place on the all-time list. Boyes is currently on an impressive hot streak. In addition to winning the 2010 8-ball world championship he has finished 2, 1, 2 in the last three Euro Tour events. The win lifts van den Berg from seventh to third in the Euro Tour Ranking. Losing finalist Boyes stays in first. Daryl Peach (England) holds on to his No.2 position. The tournament was played 26-28 August 2010 at the Entertainment & Leisure Centre Flamingo 8, Vantaa, Finland. It was the fifth event of seven on the 2010 Euro Tour. Next up is the Portugal Open which runs from 28-30 October 2010. Ga-young Kim from South Korea edged Karen Corr (Ireland) to win the 2010 US Open. Kim and Corr were tied 6-6 in the best-of-13 final before the Korean broke and ran the deciding rack. This was a repeat of last year's final. On that occasion Kim beat Corr 7-5. Vivian Villareal (USA) and Julie Kelly (Ireland) finished joint third. This was Kim's second US Open title in a row, her third US Open crown in total and her sixth victory on the WPBA Tour. Her titles have com in the 2004 US Open, the 2005 Cuetec Cues National Championship, the 2007 Carolina Classic, the 2009 US Open and the 2009 Colorado Classic. In addition she won the world title in 2005 and 2006. The event took place from 28 July to 1 August 2010 at the Riverwind Casino, Norman, Oklahoma, USA. It was the last of two events on the 2010 Classic Tour.